Review: Duke Riley, "Two Riparian Tales of Undoing"
The artist uncovers lost stories of history's losers. A tattoo artist with a vivid imagination and a knack for oddball history, Duke Riley summarizes a pair of projects from the past year as part of his latest show. The gallery's front room offers a reinterpretation of An Invitation to Lubberland, Riley's heartfelt investigation of Cleveland's Depression-era hobo jungle that was recently on view at the Museum of Contemporary Art Cleveland, while the main space presents a new version of Reclaiming the Lost Kingdom of Laird, a project for Philagrafika 2010 that relates a true tale of land theft, oil and displacement. 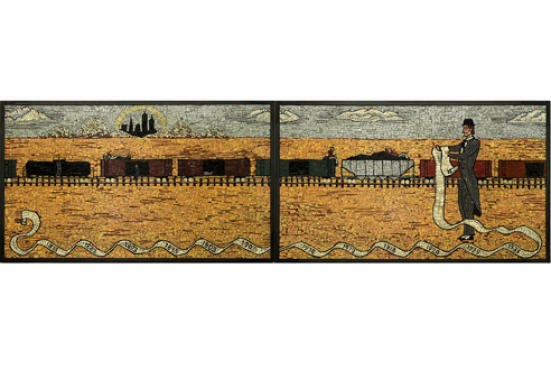 In Lubberland, a marvelous mosaic recalls Cleveland's notorious Torso Murderer of the 1930s, a serial killer who preyed upon transients camped along the Kingsbury Run, a river once lined with shantytowns, now buried under Cleveland's streets. Body parts can be seen flowing in a current made from ceramic tiles and nickels. Another mosaic depicting a tree is created out of cigarette butts, while a ring of bricks forms a well filled with whiskey—two pieces that represent, respectively, the hobo's desire for tobacco and booze. Nearby, a massive drawing illustrates the fire that brought an end to the homeless paradise at the Run. Topping off the project is a video of Riley traversing Cleveland's sewers to reconnect with the river. The Laird installation is equally compelling, and tells the story of a 19th-century Irish immigrant of the same name, who laid claim to Petty Island in the middle of the Delaware River as his personal kingdom—until being chased off by the owners of the oil company that eventually became Citgo. A drawing of Laird's domain near New Jersey dominates the room, while gravestone rubbings, newspaper clippings, commemorative plates and excavated artifacts help to return this marginalized figure to the historical spotlight—a Duke Riley specialty.